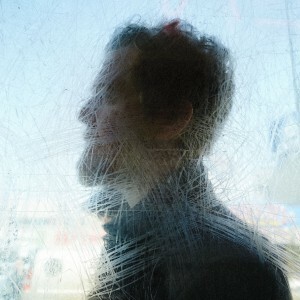 My wife and I have been fans of Glen Hansard since seeing him the 2007 movie “Once” (NYT article). Glen and his co-star Marketa Irglova won the Oscar® for Best Original Song (“Falling Slowly”) from that movie. By 2015 we figured was about time we saw Glen Hansard live after hearing so much of his music in movies, plays, and both studio and concert recordings. We finally did just that on December 1, 2015. It was about time. 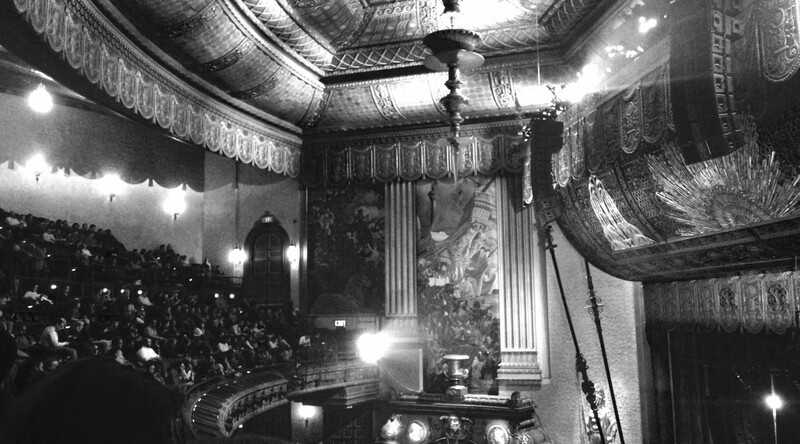 I am equally embarrassed to say that this was our first visit to the famed Beacon Theater. We have to get out more. How many artists do you know who can stand in front of a sold-out theatre audience, sing without any amplification or accompanying instrument, and fill the house with a great voice. Gen Hansard can do that. At other times, there were as many as 11 musicians on the stage, as well as the indefatigable peripatetic guitar technician Nick (the only tech I know who the audience called to the stage for an ovation). Two string players, a three-man horn ensemble, a piano player (who used both the keys and the strings), second guitar, drums (amazing with simply a basic kit), bass, a guest fiddle, and Glen. At times it was just Glen. 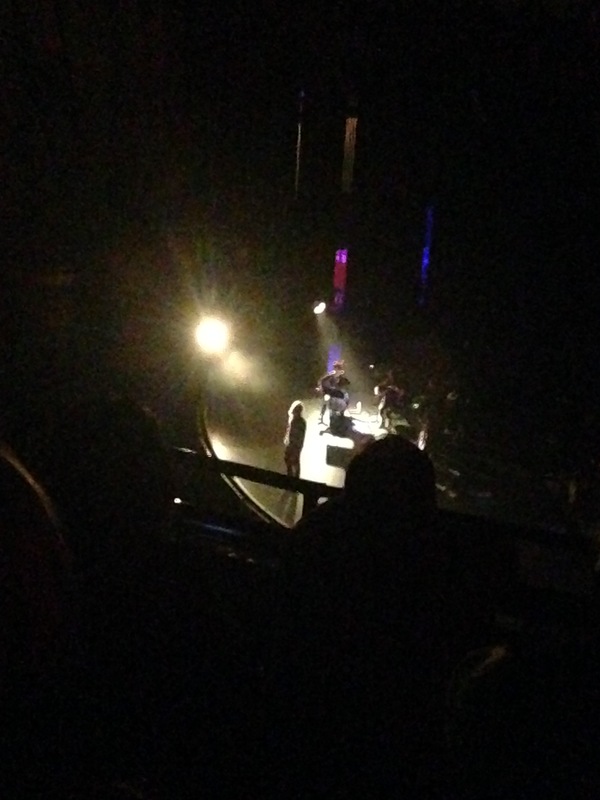 But Glen Hansard, no matter how many or few were on stage with him, always filled the hall with amazing sound. And he gave each of the band members a chance to shine. A great night. The night ended with the whole band, Nick, and the stage crew standing side-by-side singing a capella “The Auld Triangle.” The whole audience stood and sang along. It was the best singing audience (without ever being obtrusive) I’ve ever heard. Here’s a video to a similar encore from a 2014 Hansard Concert. Get to see him the next time you can. Thank you Glen. cover for Glen Hansard’s “Didn’t He Ramble” 2015 album. Postscript: we saw Glen again on September 14, 2016 at Carnegie Hall. Another great concert in another famed hall. Unlike the Beacon (which we still have not gotten back to), we’ve been to Carnegie Hall before. And we saw him again in January 2018 at the Town Hall in NYC. A nice habit to develop. 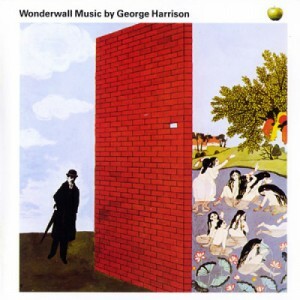 December 2, 1968: the US release of George Harrison’s Wonderwall Music, the first solo album by any Beatle. 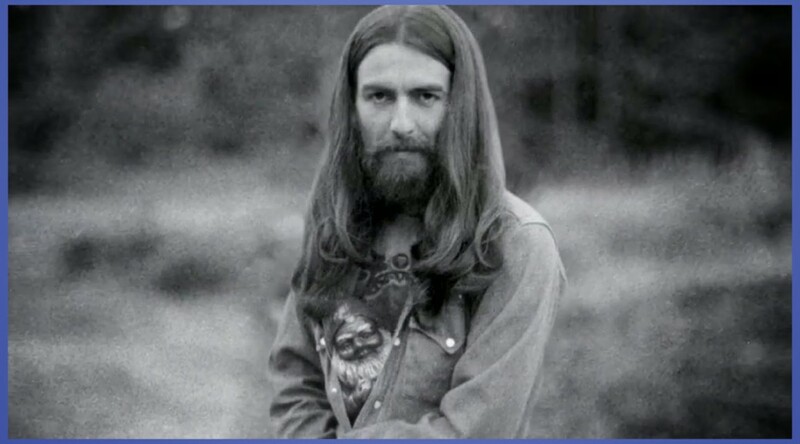 Keeping in mind Harrison’s Beatle compositions (such as Flying) and you’ll hear his influence. Wonderwall Music also used the production method common at the time of sending sound back and forth between the left and right channels. Eric Clapton and Ringo Starr make appearances. Clapton, credited as Eddie Clayton, plays lead guitar on ‘Ski-ing’, while Starr (Richie Snare) plays drums. Also, Peter Tork of the Monkees plays banjo on the album. He and Harrison became friends when the Monkees visited the U.K.
Harrison’s follow up to Wonderwall Music would be his Electronic Sound which taught listeners that George Harrison’s musical tastes were wide and deep. 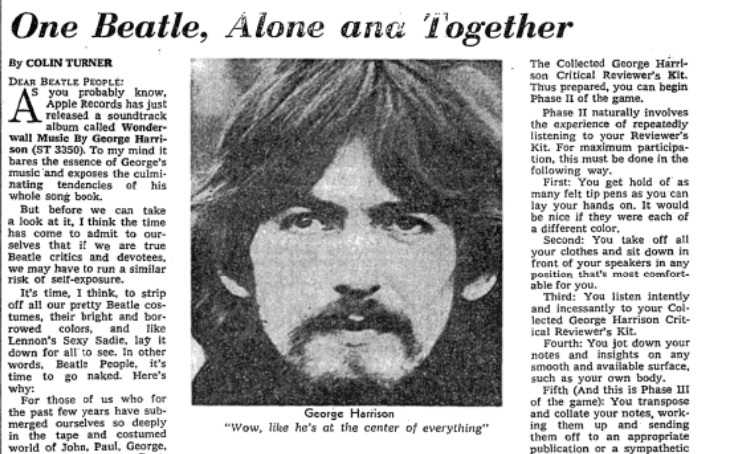 The NY Times reviewed the Wonderwall album on February 9, 1969. Colin Turner wrote, To my mind it bares the essence of George’s music and exposes the culminating tendencies of his whole song book. Interestingly, exactly a year later, on December 2, 1969, Harrison joined Delaney and Bonnie on stage in Bristol, for his first stage appearance since The Beatles’ final concert on 29 August 1966. Freed from the attentions of Beatlemania, he was able to be a largely anonymous band member, although he did sing songs including Everybody’s Trying To Be My Baby on at least one occasion. Harrison stayed on the tour for six dates until it ended. They played two shows each night, in Bristol, Birmingham, Sheffield, Newcastle, Liverpool and Croydon. 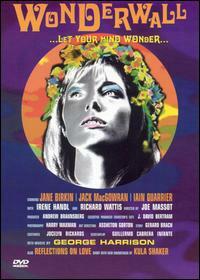 And in case you were wonder(wall)ing: Wonderwall was a 1968 film by first-time director Joe Massot that starred Jane Birkin, Jack MacGowran, and Iain Quarrier. Neither the movie nor the album are considered worthwhile by most. A hallmark of the 1960s’ cultural revolution was the the student free speech movement. In 1964, the tip of the baby boomer generation was starting college and some of them actually followed the curricula and critically examined information. The post war Red Scare and Cold War continued into the 1960s. Protesters were suspect. College campuses included. On September 14, 1964 UC Berkeley Dean of Students Katherine Towle, wrote a letter to the student political groups telling them that they could no longer use a designated plaza to solicit support for “off campus political and social action.” The plaza had been the most accessible location for student-to-student interaction. 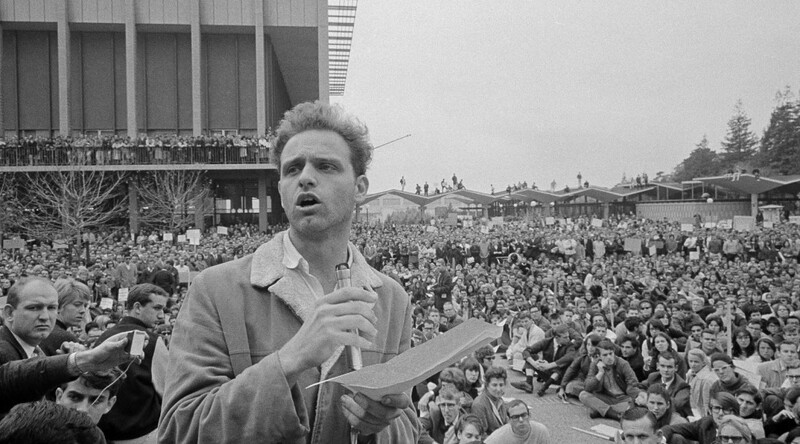 Mario Savio, shown here at a victory rally in UC Berkeley’s Sproul Plaza on Dec. 9, 1964, was the face of the free speech movement. On December 3, police arrested nearly 800 students attempting to control the student free speech movement. On December 7 classes were cancelled, but on December 8 the Academic Senate voted overwhelmingly for no restrictions on the content of speech or advocacy. It appeared that the Student Free Speech Movement had won. From jofreeman.com: When the faculty left the hall, students cried, cheered, and applauded. Symbolically, the FSM had won, but the struggle was not over; only the Regents could set policy. When they met on December 18, they voted to support the First and Fourteenth Amendments to the U.S. Constitution, but insisted on law and order. The faculty felt the spirit of their resolution had been met, but the FSM did not. When the new campus administration wrote detailed regulations, content of advocacy was ignored in favor of stringent time, place and manner rules. Scuffling over the rules and how they were applied continued…. 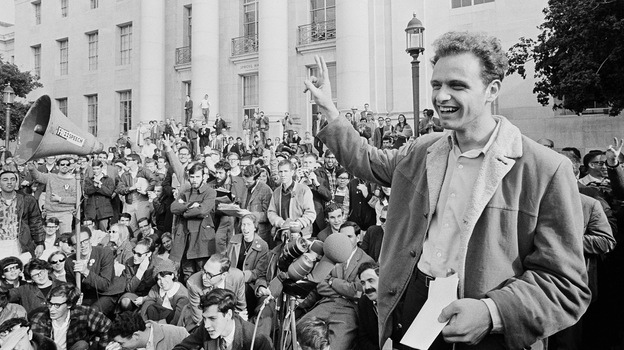 On April 26, 1965 Savio quit the Free Speech Movement (Savio quits), but student activism didn’t. Mario Savio died on November 6, 1996.